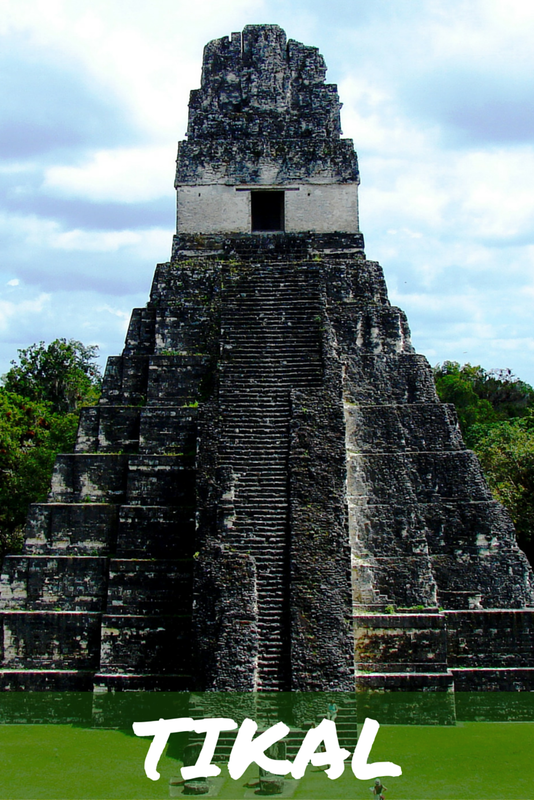 Tikal Temple I, the Temple of the Great Jaguar. 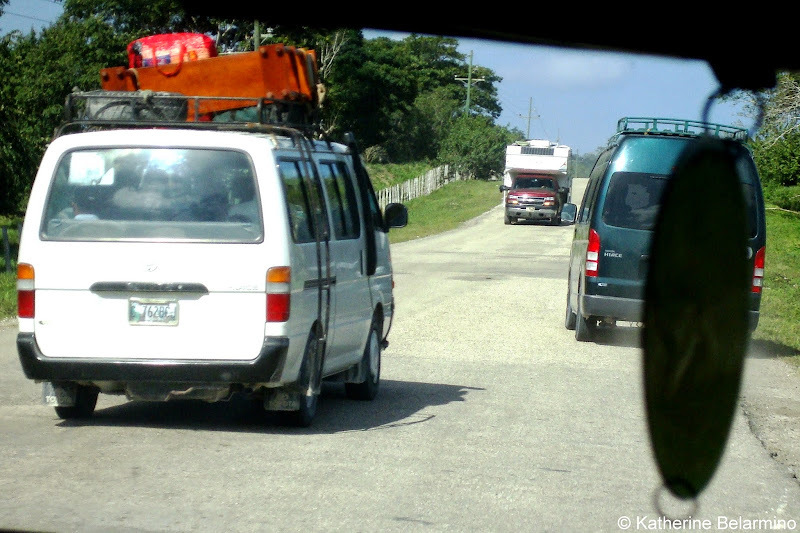 Traffic jam on the way to Tikal. 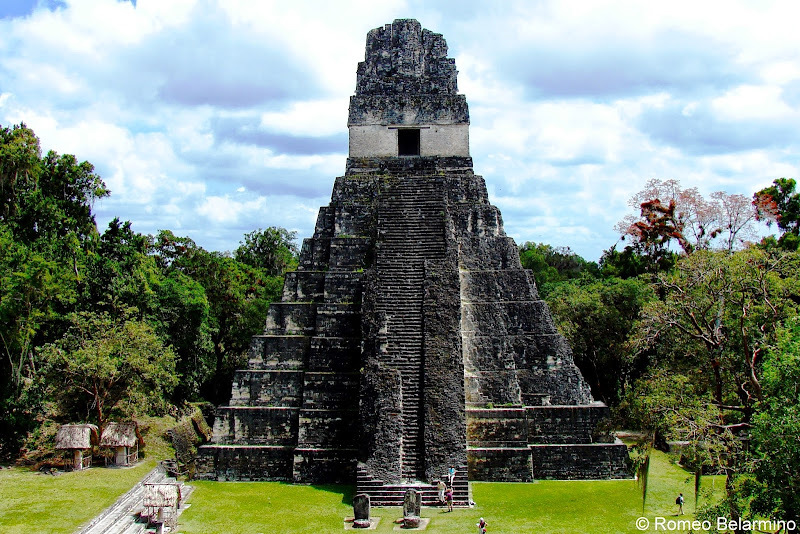 Tikal National Park is a UNESCO World Heritage Site located in northern Guatemala in the Petén region (called a department in Guatemala), just over 50 miles northwest of the Guatemala/Belize border. Driving through Guatemala to Tikal is an adventure in itself. We drove for over an hour on bumpy roads, many of which were dirt roads. Because of the bad condition of the roads drivers did not strictly adhere to the rules of the road, but rather drove on whatever side didn’t have potholes. It was rather unnerving to look ahead and see trucks coming towards us on our side of the road. 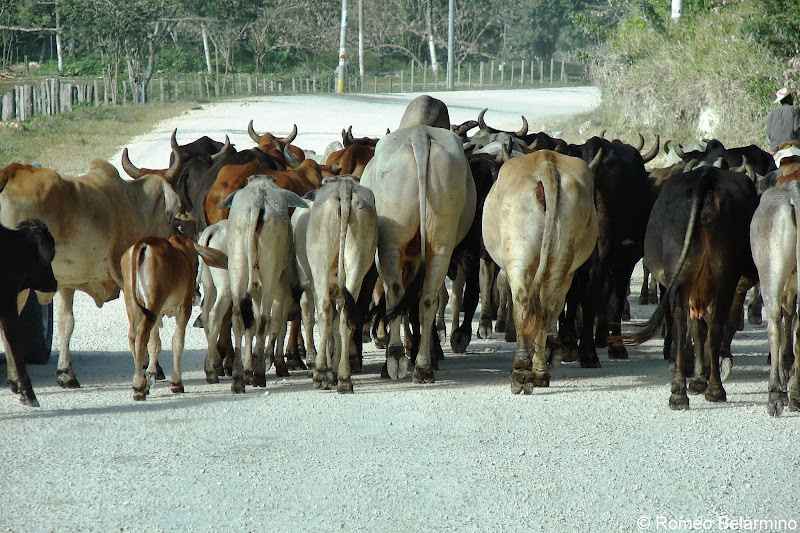 We even got stuck for a short time in a traffic jam of a herd of cows being herded by a Guatemalan cowboy. Driving in lanes is overrated. 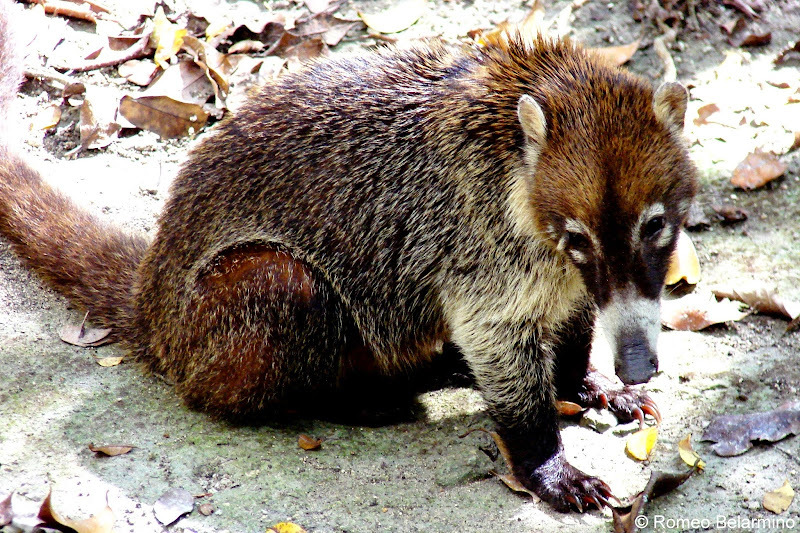 Along the drive into Tikal National Park are reminders that you’re in a rainforest with wild animals. 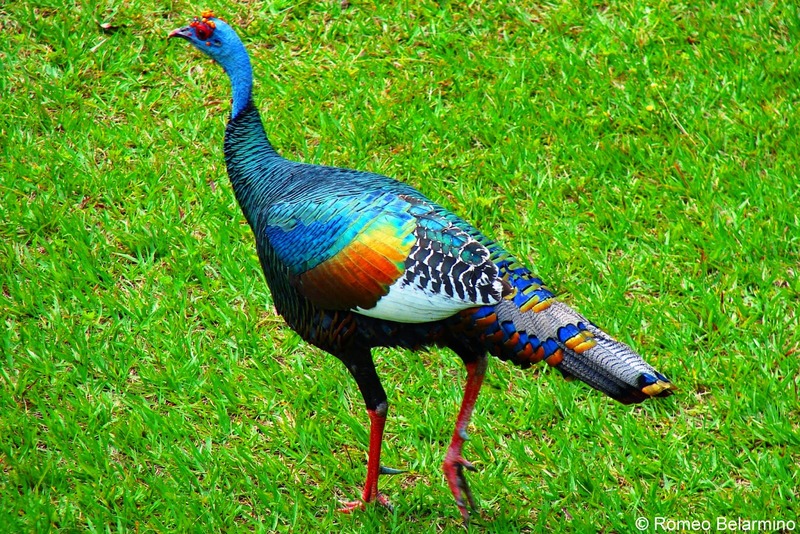 We started passing signs picturing the animals we might see. At first they were signs for small animals like turkeys and coatimundi, but then came the sign for jaguars, not an animal I wanted to encounter. Tikal is the largest excavated Mayan site in the Americas, with approximately 10 square miles excavated, and the park covers over 200 square miles. Tikal was first excavated by the University of Pennsylvania starting in 1956. Excavation and restoration continues through today, overseen by the Instituto de Antropología e Historia. While many of the ancient Mayan structures have been uncovered, countless more remain untouched, covered by over a thousand years of jungle. Our guide Antonio started our tour through various groups of Mayan ruins including the Acropolis Central, a grouping of small temples and residences. At this point the ruins were similar to what we had seen before in Belize. But then we started walking along the outside of one of the buildings and turned the corner. Antonio was watching us, waiting for our reaction. What we saw was truly awe inspiring. Before us was the Great Plaza (Gran Plaza), one of the most commonly pictured views of Tikal. Our first view of Tikal's Great Plaza. There are three major buildings that make up the Great Plaza. To the east is Tikal Temple I (Templo I), the Temple of the Great Jaguar, which was built for the king and completed by his son. To the west is Tikal Temple II (Templo II), which was built by the king in honor of his wife. Temple I can no longer be climbed by visitors as people have fallen, but Temple 2 can be climbed. To the north of the Great Plaza is the Acropolis del Norte. The North Acropolis is a larger area with a number of temples on a platform. There are stone masks built into the walls. Antonio explained the Mayans built everything like an onion. Each subsequent ruler would build on top of what the previous ruler had built, but would never destroy what had come before. 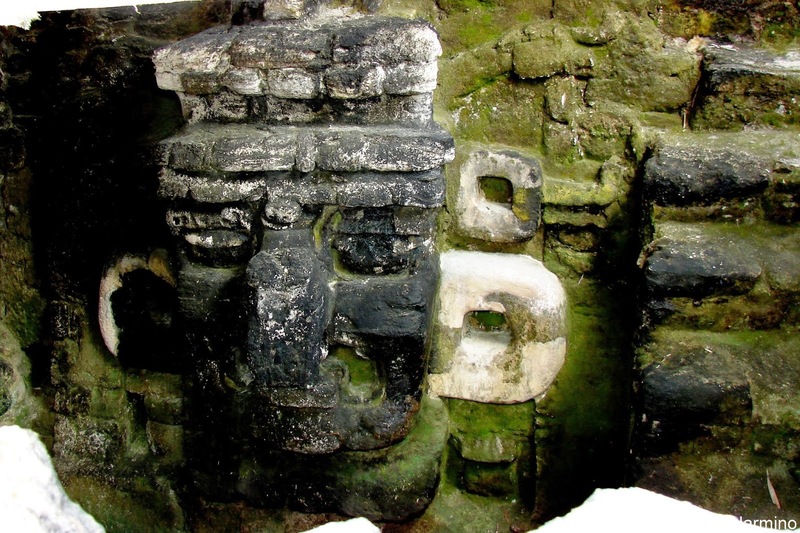 An uncovered stone mask built into the wall of Tikal's Acropolis del Norte. 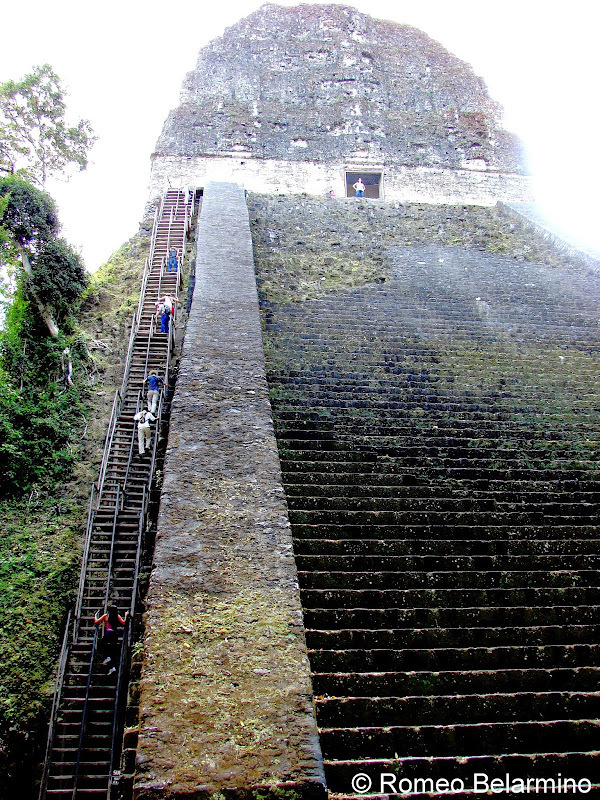 We left the Great Plaza and made our way through more ancient Mayan ruins to Tikal Temple V (Templo V), which we climbed using some very steep wooden stairs. The stairs are not for the faint of heart and are so steep it’s better to climb down them like a ladder. If you’re afraid of heights, you may want to avoid climbing this temple. Romeo climbed with me, took one look at the view, and immediately turned around and climbed down. I stayed up top longer for the view, but was petrified the entire time. Not only are you incredibly high, but the temple is so steep one false move and there is no way you could keep from tumbling all the way to the ground below. Temple V does provide a great view of the other pyramids of Tikal, and yet these aren’t the views you’re looking for. We continued on to Tikal Temple IV (Templo IV), the tallest building in Tikal at 212 feet and which was completed in 741 AD. 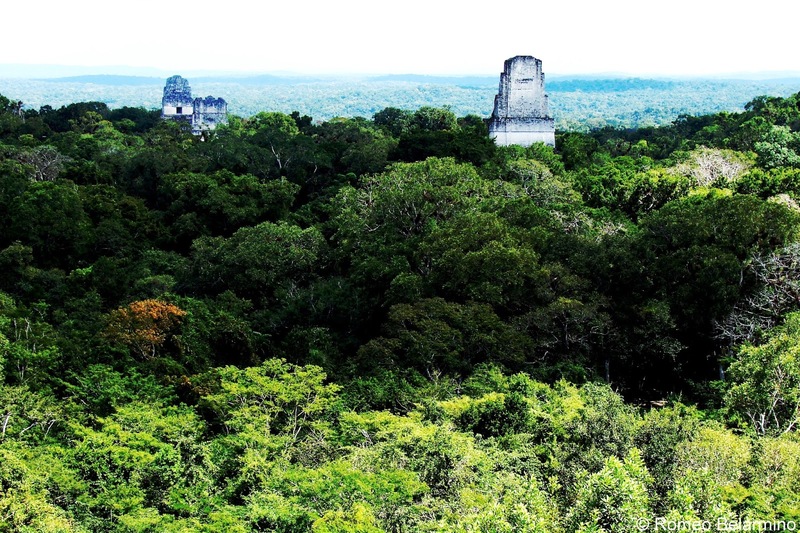 This is where you see the view from Star Wars, with Temple I, Temple II, and Temple V peeking out from above the rainforest tree line. Thankfully the temple with the best view is not the scariest. The Star Wars view from the top of Tikal Temple IV. 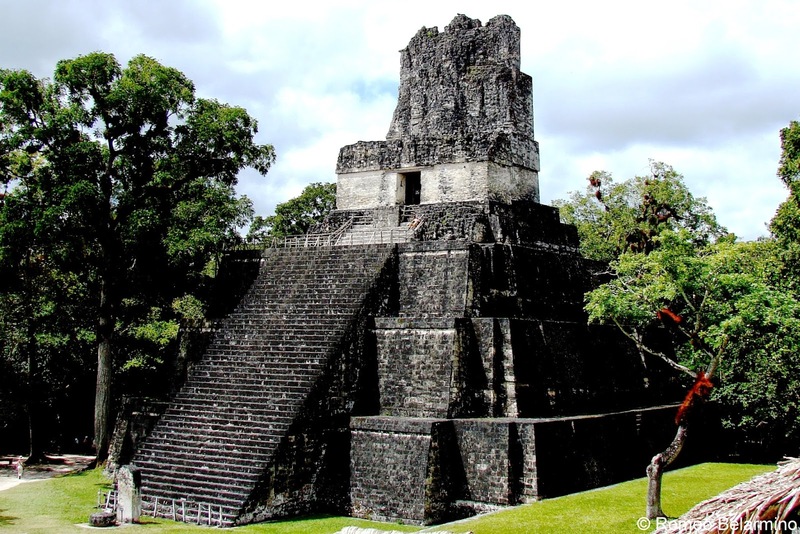 Independent travelers can get to Tikal from Belize via chicken bus or rental car, but it is so much easier to arrange a tour and guide. 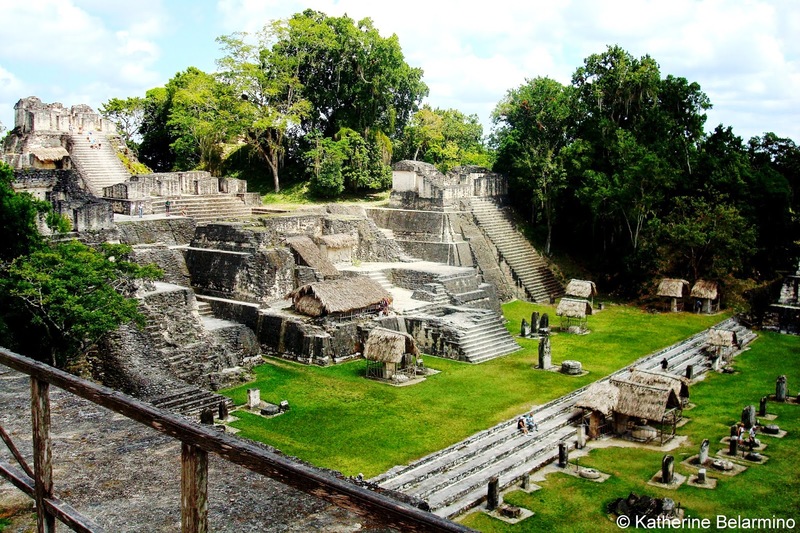 We booked a tour from Belize to Tikal with MayaWalk Tours. MayaWalk Tours books small groups tours, but we ended up being all by ourselves with a private guide and private driver. Antonio was a great guide and we learned so much more about what we were seeing with him to guide us. We were especially impressed with Antonio because he carried around a huge book full of Mayan history, using it to show us information about the Mayan calendar and explain Tikal history. We were actually impressed with all our guides from MayaWalk (we also booked our Actun Tunichil Muknal (ATM) tour in Belize with them) because they did not exaggerate and sensationalize their stories of the Mayans. Acropolis del Norte in Tikal's Great Plaza. 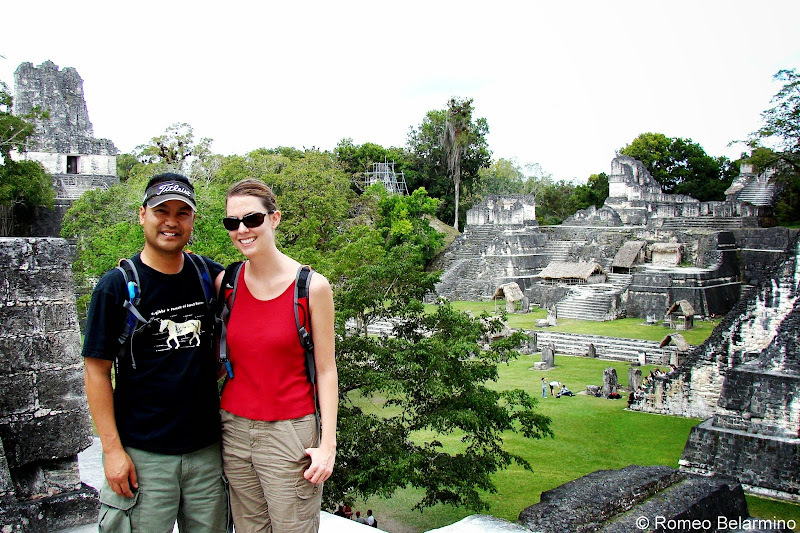 If joining a Tikal tour from Belize, bring your passport, as you will be crossing an international border, camera, water, snacks, bug spray, sunscreen, and hiking boots. Before entering Tikal National Park our guide Antonio took us to a little restaurant outside the park for a typical Guatemalan lunch of chicken, rice, vegetables, and tortillas. Whether you are traveling to Belize or Guatemala, be sure to set aside a day to visit the spectacular Mayan ruins of Tikal. Make it to Tikal, you must. You, impressed by the sight of these giant pyramids built by an ancient Mayan civilization so long ago, will be.